Iranian authorities say they have arrested dozens of people on the eve of the last Wednesday of the Persian year (which ends on 21 March). Speaking to state-run IRNA news agency late on Tuesday, Tehran’s Chief of police said that 23 people who took part in the events of Chaharshanbe Suri (an ancient festival) were identified and arrested. The regime implemented strict security measures all over Iran to intimidate young people and prevent them from coming out to celebrate. Earlier, Hossein Rahimi had announced that 280 so called “troublemakers” were arrested in the capital of Iran in an effort to create an atmosphere of fear before the annual Feast of Fire Festival. According to the ISNA state-run News Agency, the Greater Tehran Chief of Police announced that the arrests were made in the sixth phase in the “plan” to deal with troublemakers. “We are getting close to Chaharshanbe Suri and one of the goals of this plan was to deal with these people,” he said. He also threatened the public against actions that he deemed as “destructive” in the Feast of Fire Festival adding that their cars would be impounded until the end of the 13 day Nowruz holiday. Rahimi said that the police would be in full alert for Chaharshanbe Suri. Young Iranians went out into the street to leap though bonfires and set off firecrackers, traditional on Chaharshanbeh Suri – or Red Wednesday – held on the last Wednesday of the Persian year. It is a remnant of the ancient religion of Zoroastrianism, where fire represents God’s light or wisdom and is celebrated by jumping over bonfires and lighting firecrackers. Singing, dancing and eating together are also part of this fire festival. But for many Iranians, this prehistoric Persian event goes far beyond being just a cultural celebration. Especially for the young, it provides an opportunity to vent frustrations at the government. 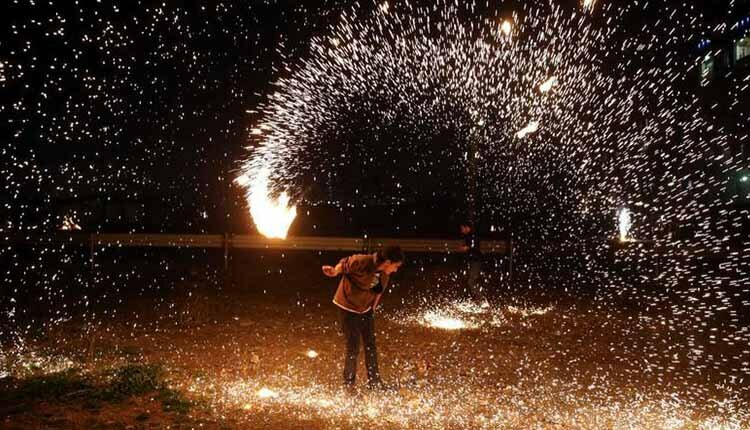 Fearing that the festival, will get out of hand, Iranian officials, specially clerics, consider it pagan and encourage people not to celebrate while security institutions arrest many people before Chaharshanbe Suri for supposedly selling and buying firecrackers. According to the Islamic Revolutionary Guards affiliated Tasnim News Agency, Iran’s Supreme Leader, Ali Khamenei issued a fatwa on March 19, against Iranians celebrating the “pagan” event. “There is no religious basis for Chaharshanbe Suri and it is not permissible if it involves harm and corruption or promotes false beliefs,” he said when asked about the Fire Festival.